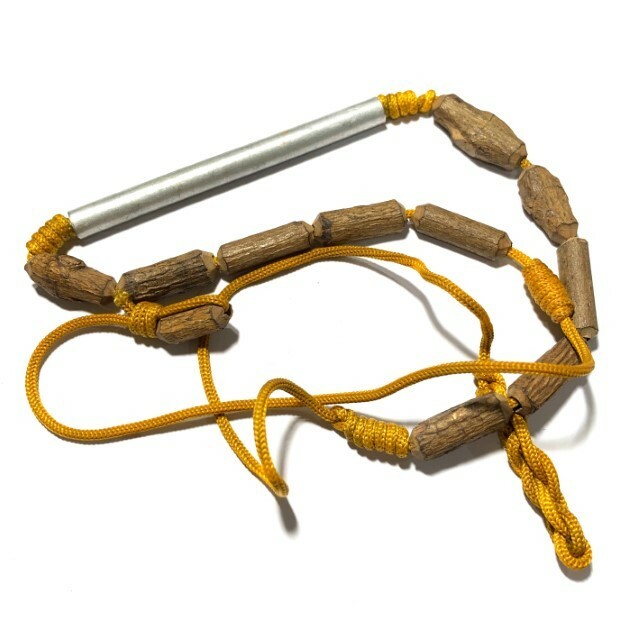 Takrut Tone with Sacred Paya Taew Aew wooden beads for healing and protection, and alleviation of backaches. 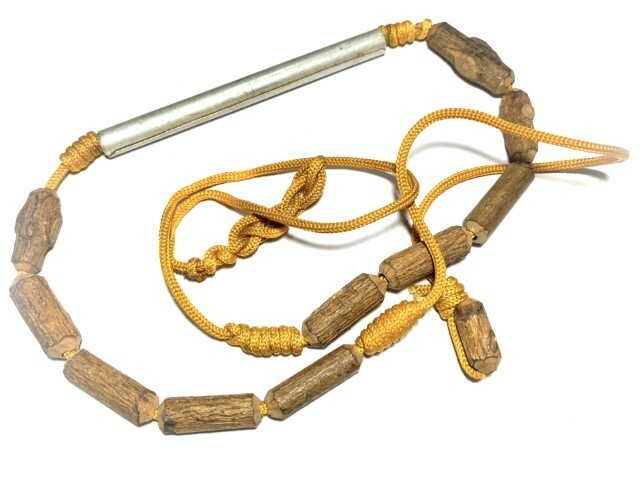 A very rare talismanic charm of the great Luang Phu Maekh, of Wat Lam Gradan (Minburi), which consists of a metallic Takrut Tone scroll spell (3.5 Inches), attached to a garland of pieces of Mai Paya Taw Aew Dtaay Prai. 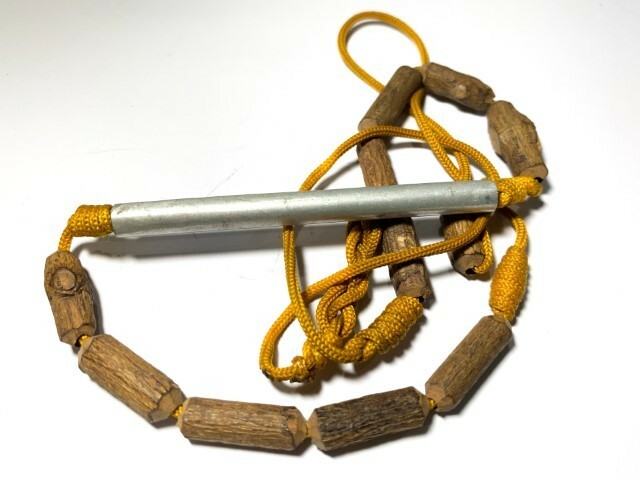 Mai Paya Taw Aew is a magical wood found in the forests, considered to possess the power to alleviate aching back and waistline. 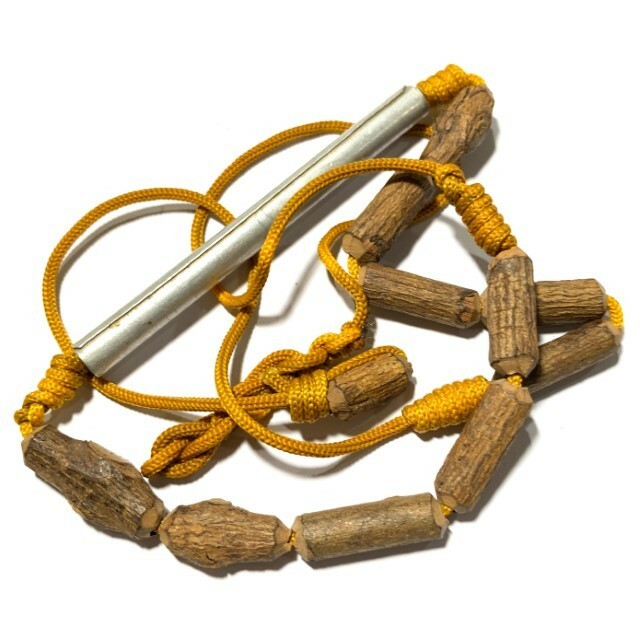 The wood has protective and healing powers, along with the Takrut for Serm Duang Karma Improvement. 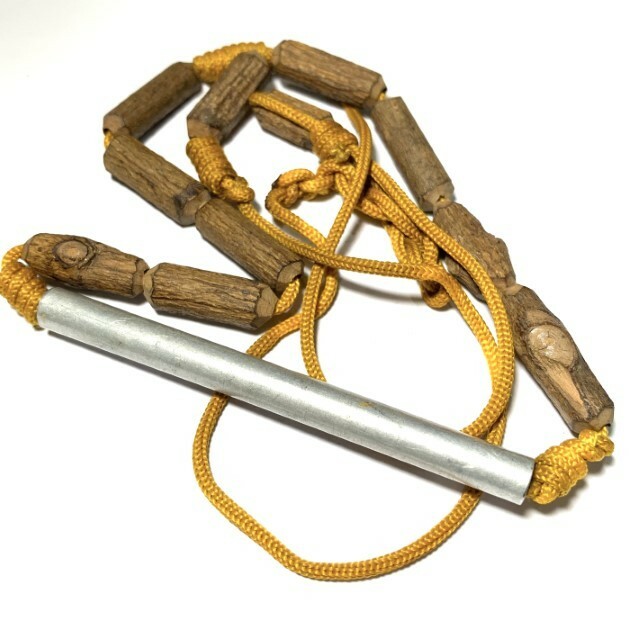 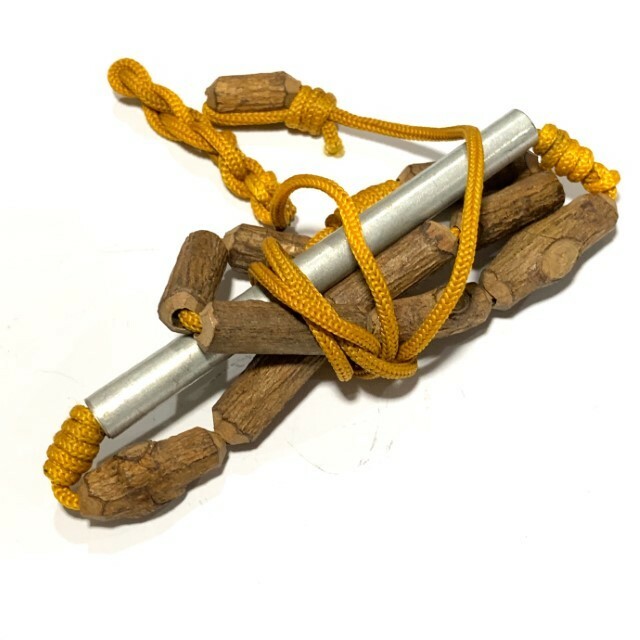 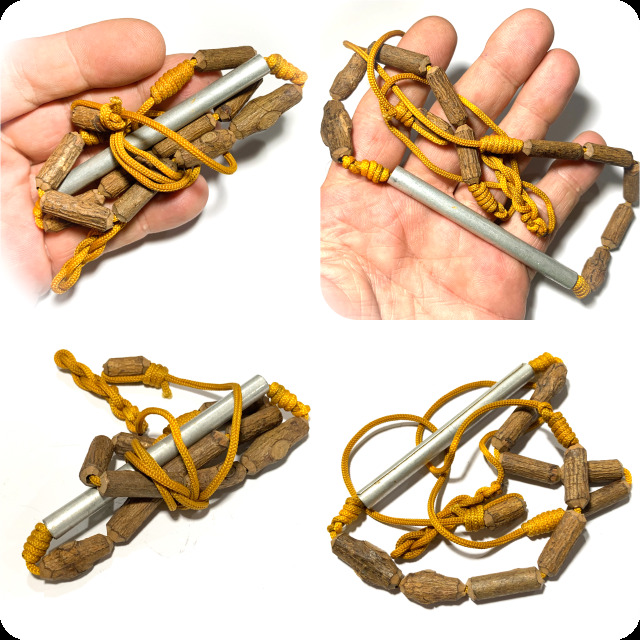 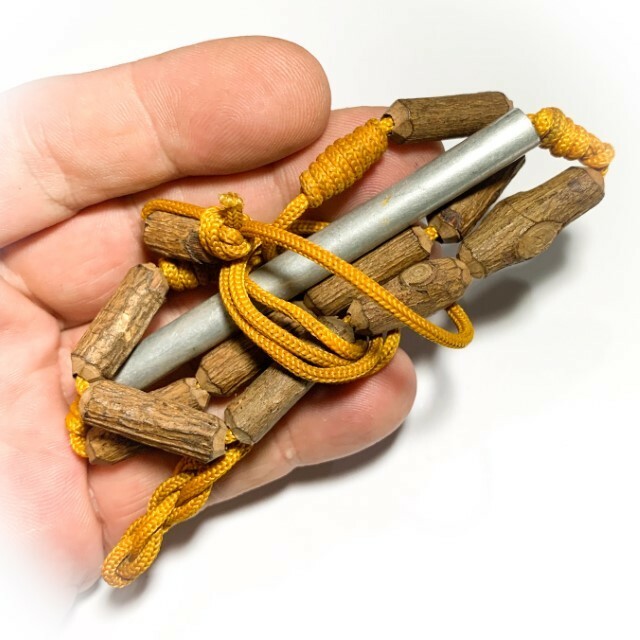 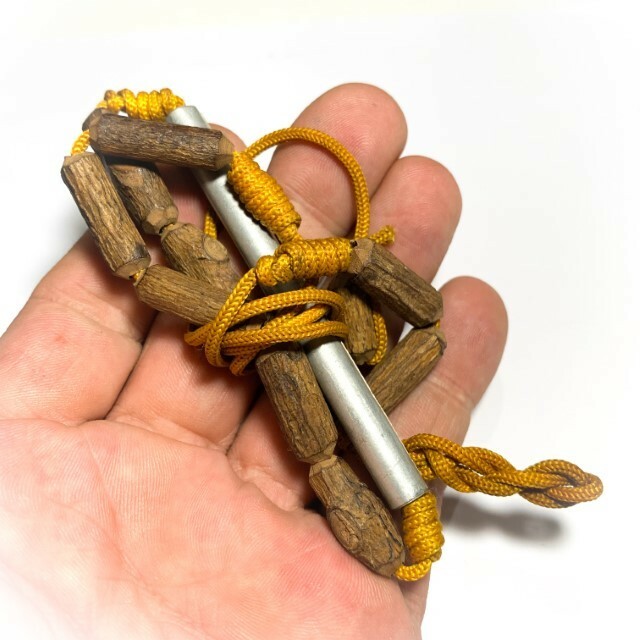 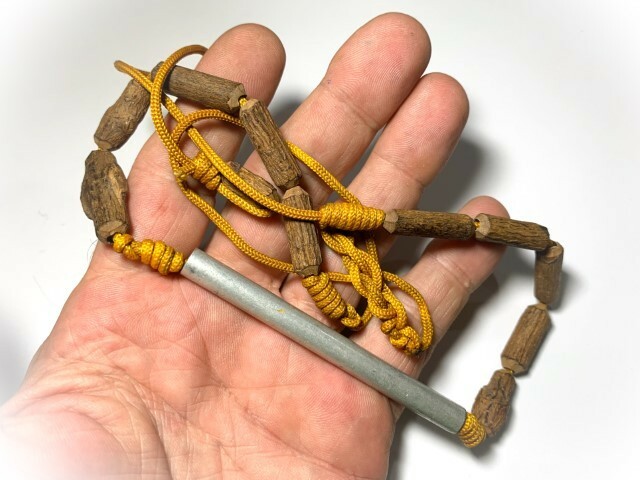 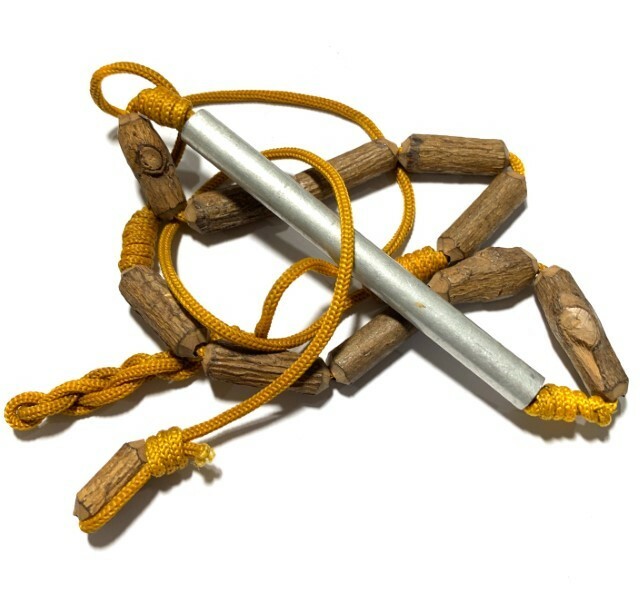 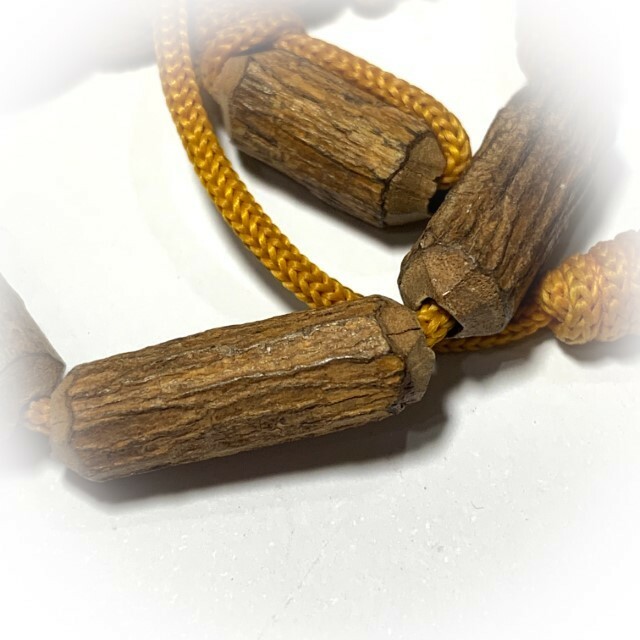 Mai Paya Taw Aew is a very rare sacred wood found in the forests, which has been used by olden days folk for centuriies to wear on a cord around one's waist for protection from poisonous beasts and to ease backpains, and heal illnesses. 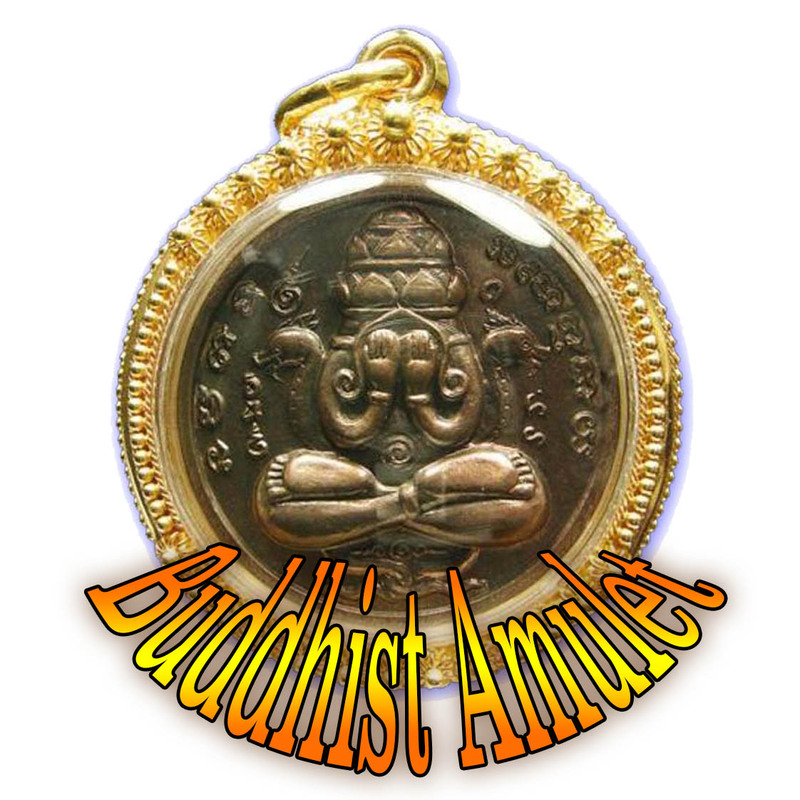 The Takrut serves to bring other blessings such as Serm Duang, Metta Mahaniyom and Klaew Klaad to the compendium. 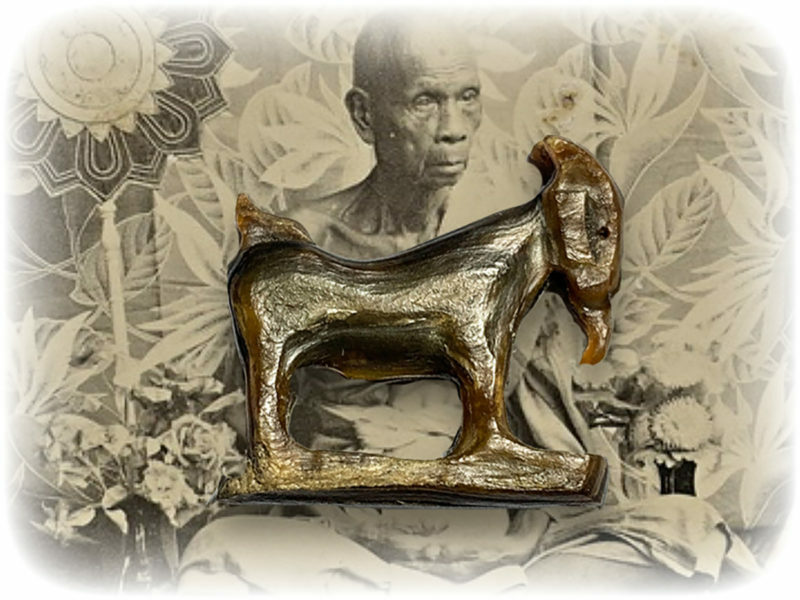 Luang Phu Maekh Became very famous for his Palad Khik amulets made from Mai Kheuy Dtaay Prai sacred wood. 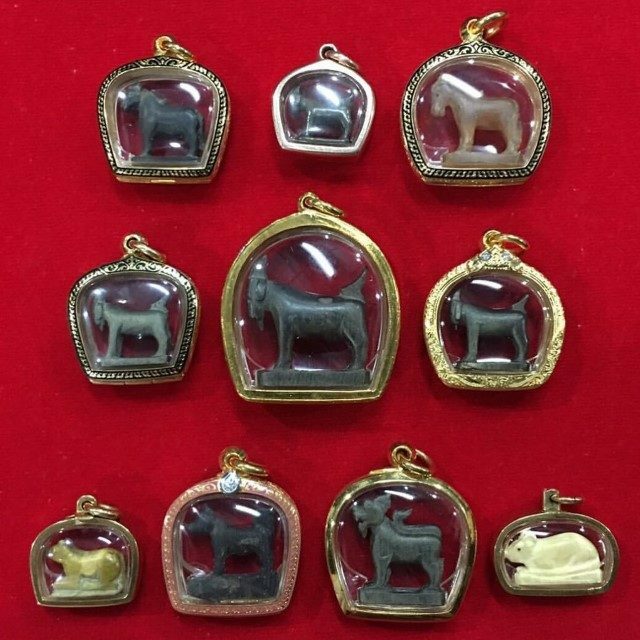 Local Devotees consider the Palad Khik Mai Kheuy Dtaay and other amulets of Luang Phu Maek to be extremely sacred. 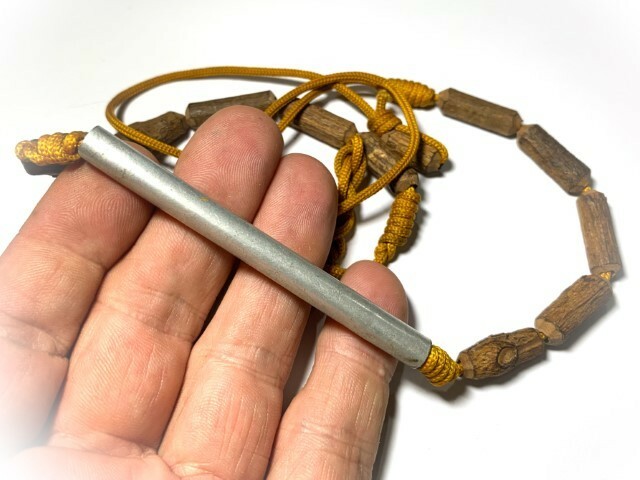 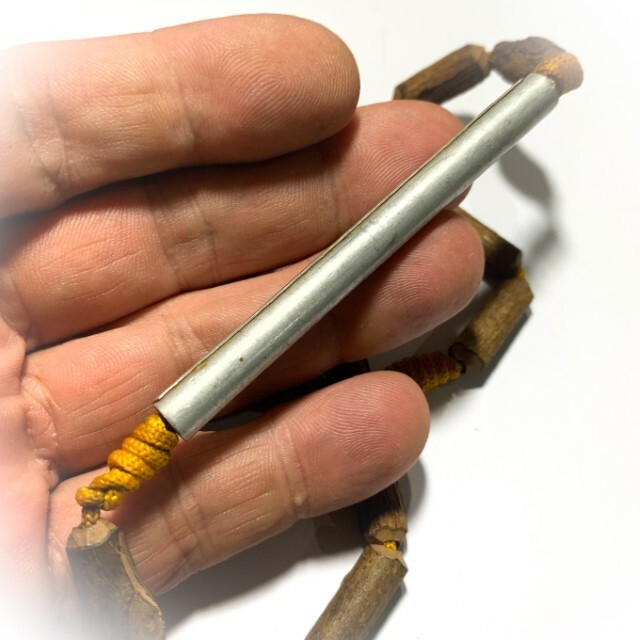 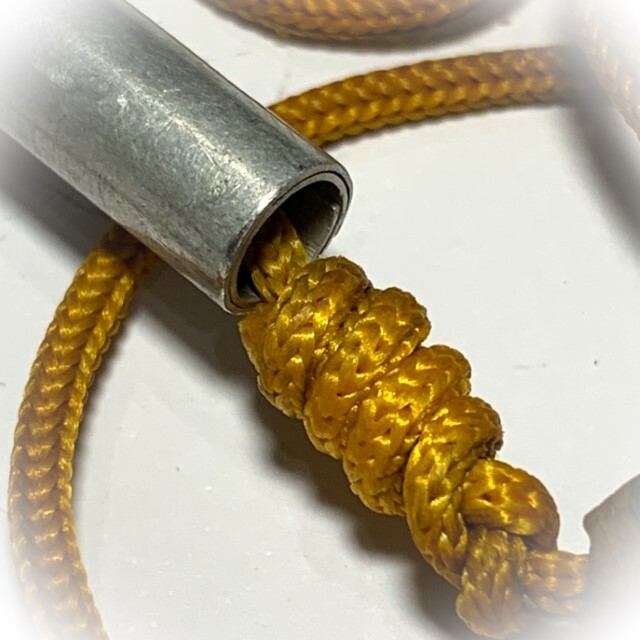 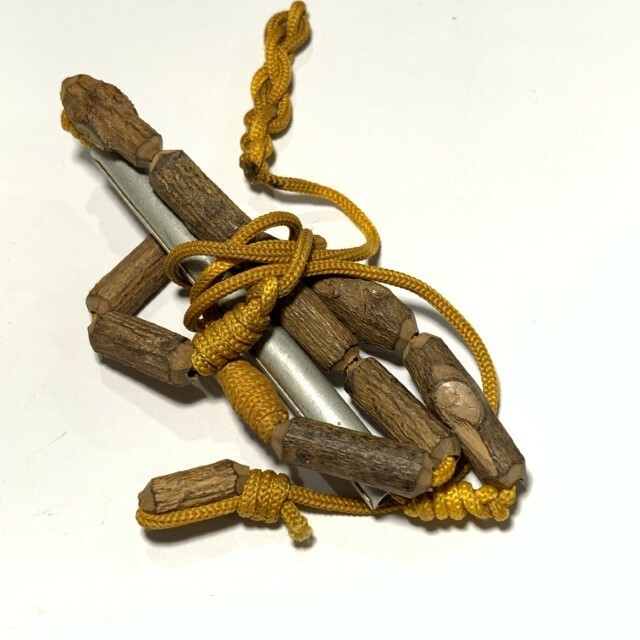 His Palad Khik are very rare, but an item like this Takrut Mai Paya Taew Aew is amongst the rarest items, for the Paya Taw Aew wood is one of the rarest and most difficult sacred woods to find, and so only very few were ever made. 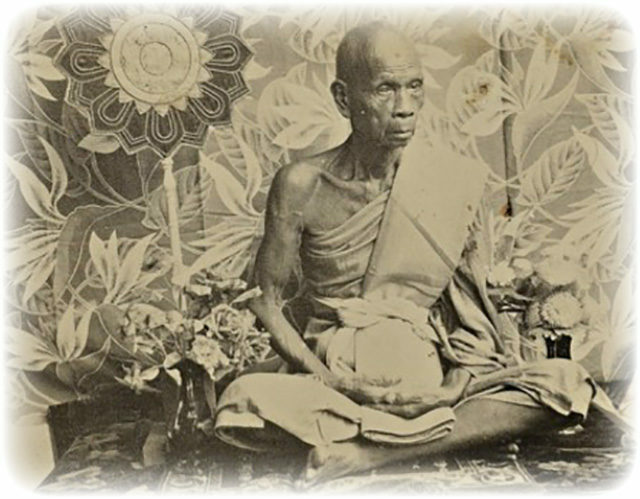 This is seen as a miracle of Arahantship by devotees.. Luang Phu Maekh was known for his direct speech which did not beat about the bush, but also for his great truthfulness of speech, and open hearted honesty. 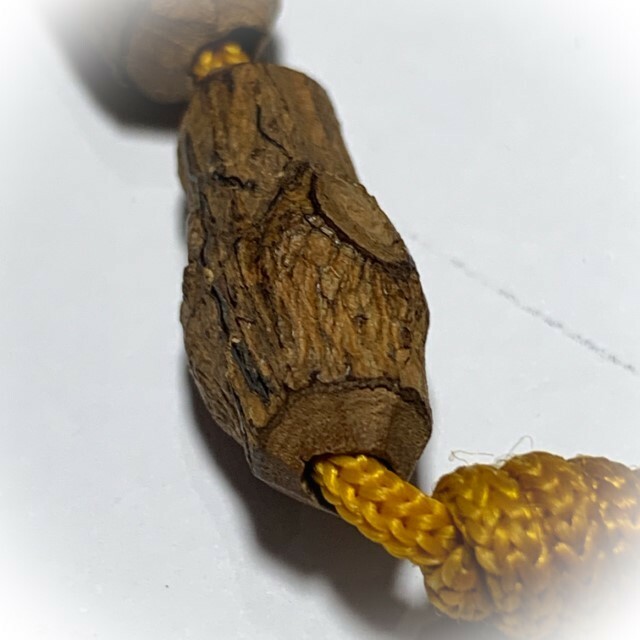 His sacred wooden amulets are known for their power to ward off the dangers of poisonous beasts such as snakes and deadly insects, as well as for its Kaa Khaay power to increase successful sales of goods.